Around 17th of June each year, the Viking Festival takes place in the Viking Village in Hafnarfjörður. 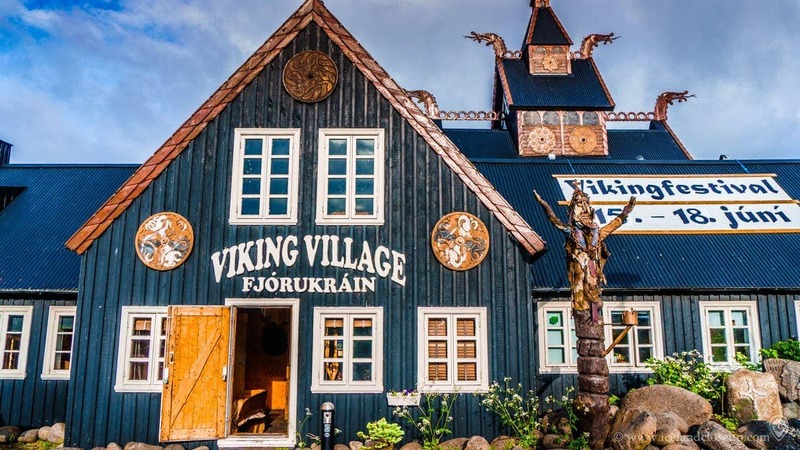 The festival is held by Fjörukráin, which runs a Viking restaurant and a hotel, located in the center of Hafnarfjörður, just a 20-minute drive from downtown Reykjavík. This four-day event has been held for over 20 years in this beautiful town. Throughout the years it has been one of the most popular summer events in Iceland. 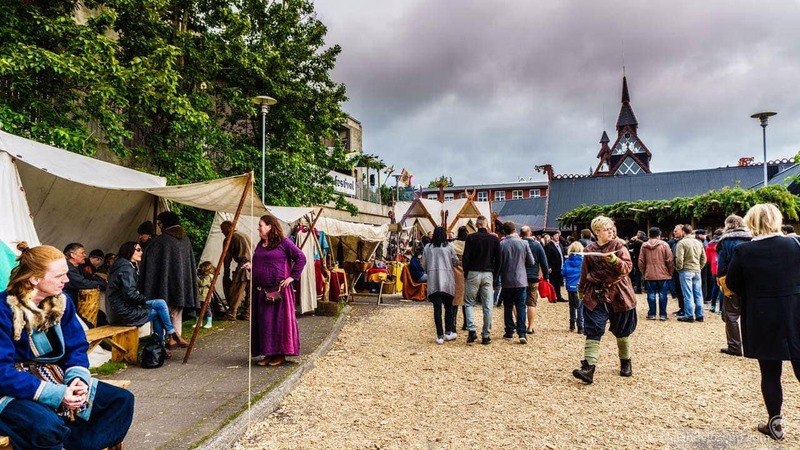 From art to food, the Viking Festival attracts many locals and tourists every year, seeing with their own eyes how life was among the Vikings in the old days. It’s interesting for us modern world humans to experience the atmosphere of the Middle Ages. As soon as I walked through the entrance of the festival, it felt like I had time traveled backwards a thousand years. The surroundings were all in the medieval Viking style. The festival is situated around a group of typical Viking houses, which display the Viking architecture well, some also resemble Viking churches or ritual houses. Others display the Icelandic turf house style and some of the smaller ones you can rent to sleep in, as part of the hotel. Even the ground is covered with mulched wood bark which makes me feel like I am walking on natural ground rather than hard tarmac. The people at the festival and even their kids are all in Viking clothes with their swords and axes, dressed in full armor. Showing the Viking culture, the kids run in and out of the Viking tents, and the adults display their handmade designs to potential customers, or tell stories of the Viking era and their origin. Everyone has their smile on and is doing their best to give the visitors a good time. There are a few moments that make me forget I am living in the 21st century. The Vikings at the festival are both native, and from foreign countries. The main group of Vikings is local, from a Viking club called Rimmugýgur in Hafnarfjörður. They all gather here with their best talents, clothing, design and armor to celebrate. The field is lined with Viking tents that constitute a prosperous Viking market. At the market you can buy various handicraft items which reflect the customs and traditions of the Viking era, such as jewelry, clothing, furs, decorations and other souvenirs. Some even have food for you to sample. The viking religion was the Old Norse religion, the Icelandic name is Ásatrú. The Vikings worshipped pagan gods, including Odin, Thor and Freyja. At the festival their figures can be seen on some handmade jewelry and other items. You can also see many products carrying individual letters or words from the old written Viking language. The letters are called runes and are part of the runic alphabet. If you want a temporary Viking tattoo or just some simple Viking images as souvenirs, some artists at the festival can draw very good pictures for you. All merchants are very friendly and are willing to share interesting stories of stepping back in time and dressing up in Viking costumes. Most of the Vikings at the festival look very big and strong, especially the men. Their appearance is also unique, especially their Viking hairstyle. They have long hair and long beards. In fact Viking hairstyles are fairly popular in our modern society. I feel it makes men look very tough and cool. While I am walking around the area, there is a constant smell of grilled and smoked meat enticing my empty stomach. 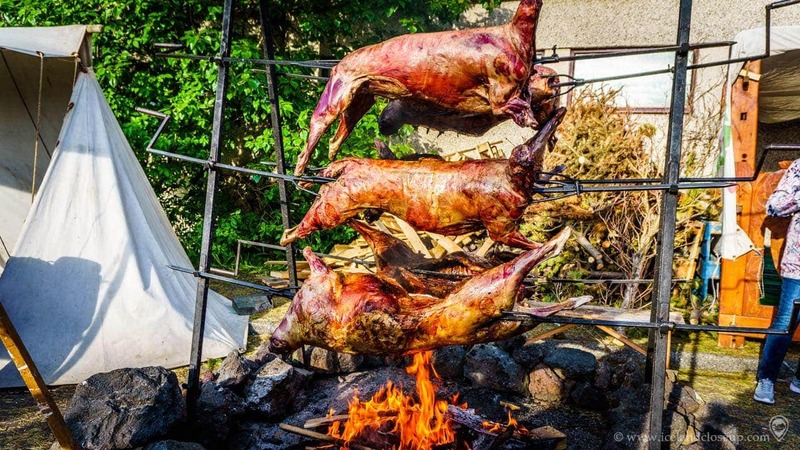 That’s because lambs are roasted above an open flame! Not something you see every day but makes you feel very hungry. When the meat is ready you can buy a piece of it as part of a meal. Grabbing a cup of coffee is also possible if you can’t bear the open flame and prefer something a little more modern. You can sit down at the restaurant or the hotel for refreshments or even a full Viking meal. The decorations inside the restaurant are also worth viewing. There is a variety of interesting events going on during the festival. You can have your fortune predicted by a fortuneteller, enjoy beautiful melodies sung by Viking musicians, or watch various Viking performances. You can also have a little adventure and take part yourself by learning ancient archery techniques, or even axe throwing skills, from experts. Just remember to follow the instructions carefully so no one gets hurt! 🙂 If you prefer not to put the life of those around you in danger, walking around and enjoying the moment is well worth it, because the atmosphere of this festival is really the key. All of a sudden I hear yelling, fighting and the sounds of weapons striking from somewhere in the field. Crowds immediately gather. Adults and children alike are very excited about what is happening. Viking combat, one of the highlights of the festival, is about to begin! A group of Vikings dressed in full armor, with swords, shields, spears and axes gather on a grass field and start provoking each other. Some of them are wearing helmets and all are wearing light armor skin clothing from the Viking age. Even some monks are participating in the fight! As one of the the most exciting attractions during the festival it might look a bit scary to some but it’s all just for fun. It realistically restores the traditions of the Viking life. Viking combat is described in detail in the famous old Icelandic sagas such as Njáls Saga and Egils Saga. In those stories Vikings often fight for land, goods, women, children or revenge. The Viking battle we are watching also follows a storyline presented to the audience by a storyteller. Parts of the story are very funny and interesting, but others are violent and brutal. After a hard battle in which many have been “killed”, there are few survivors. They continue in single combats, which I find very interesting and fun to watch. The crowd starts to yell and scream to support their favorite Viking. The show doesn’t end until there is only one survivor and all the others are “dead”. The survivor then has the power to bring everyone back to life. SPOILER ALERT (Don’t read the next paragraph if you have not seen the show or want to see it in the future). The show ends with the Vikings attacking the audience! … well almost 😉 They make a lot of noise with their armor and start screaming, running towards the audience and not stopping until they are right in front of you. It‘s a bit scary if you don’t know what’s comin! I have been to the Viking Festival several times and the atmosphere never lets you down. 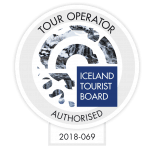 I highly recommend visiting it if you are in Iceland during this time, you won’t regret it! Leave us a comment below if you have any questions. If you’ve already been to the festival, tell us how you liked it! 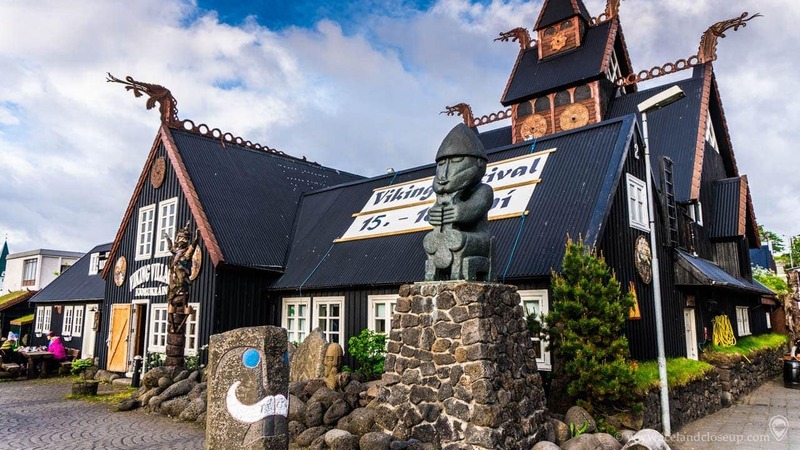 The Viking Festival is held at the Viking Village which is located in the center of Hafnarfjörður. It takes about 20 minutes to drive from downtown Reykjavík or 30 minutes by bus. You can take bus no. 1 from downtown Reykjavík and get off at Fjörður shopping mall, in Hafnarfjörður. From there it’s only a short walk to the Viking Village. The admission fee is 1000 kronas for adults, 600 kronas for children. I believe children aged six and younger get free entry. 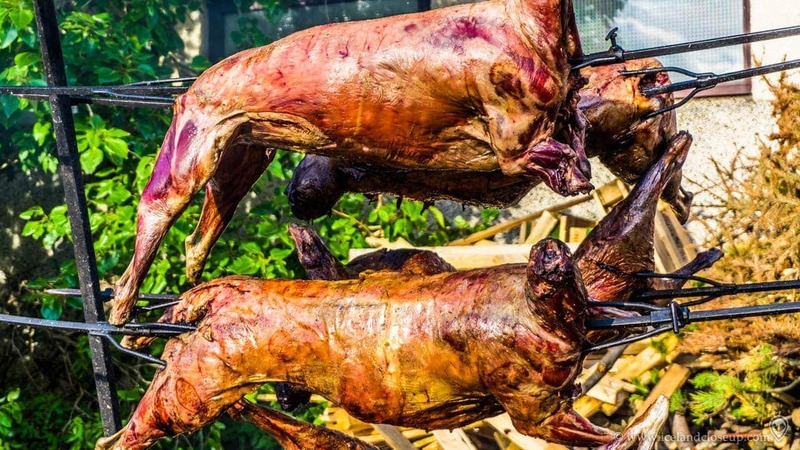 The Viking Festival is always held around the 17th of June, which is Iceland‘s national day. This year it ran from 15th to 18th of June. The performances are very well organized. Each performance is rotated throughout the day, for example the Viking battle is staged three times each day. You can check the opening date and schedule online at http://fjorukrain.is. Feel free to share this article on your favorite social media! And please leave a comment below if you liked it! I’m a native Beijinger who moved to Iceland in 2013. I have a bachelor‘s degree in English and in Icelandic. I love to travel and previously worked as an English speaking tour guide in Beijing. If you like my website feel free to share it with others and follow me on any of the social networks.